We have all grown up with a fridge in the kitchen and know that the domestic kitchen fridge is a cold box designed to keep food and drink cold and fresh for a comparatively short period of time. Wine storage is not a subject often discussed at home and although wine is a drink, it needs different conditions to those inside a kitchen fridge. Wine should never be stored in the kitchen fridge for more than a few days. A kitchen fridge is too cold for wine and too dry for the cork. So why do manufacturers use the term wine fridge or wine cooler? A kitchen fridge is colder at the top than at the bottom due to the way it is manufactured and most wine fridges are an adapted kitchen fridge. A wine fridge or wine cooler is designed to keep white wine at a cold serving temperature (8ºC - 10ºC) and red wine at a serving temperature of 16ºC – 18ºC which is colder than room temperature, hence the term ‘wine cooler’. Neither of these wine service temperatures is ideal for storing wine, as wine is ideally cellared and allowed to mature at 12ºC - 13ºC. Wine stored for any length of time longer than a few months at too cold a temperature will gradually loose its flavour as the cold crushes the delicate structure of the wine. Drinking wine at the right temperature measurable improves the flavour. 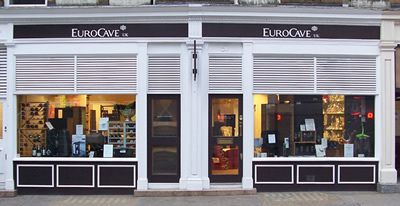 EuroCave manufacture units ideal for wine storage or wine service. EuroCave offers single temperature wine cabinets for short or long term wine storage as well as multi-temperature wine service fridges.